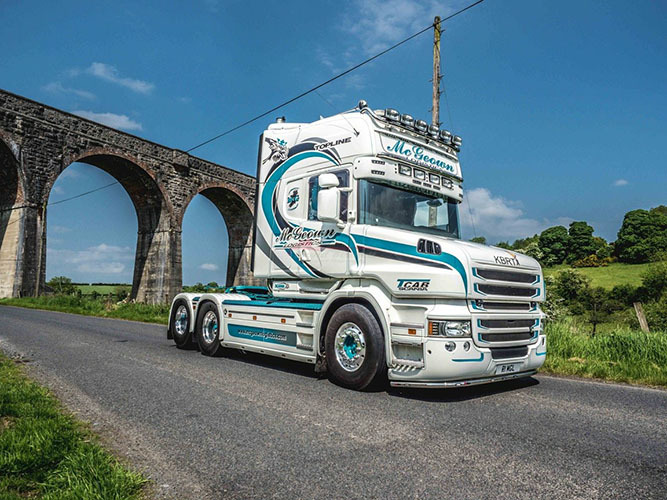 Punchestown Racecourse was the place to be on Saturday, June 9 and Sunday, June 10 last as it played host to the Full of the Pipe Truck Show. Gary McGeown of McGeown Logistics Ltd travelled down from his Newry base for the first time and it proved to be a worthwhile trip. At McGeown Logistics, they have over 25 years’ experience in transporting all types of goods from Ireland to the UK and Europe with many valued contacts Europe wide. Francis’ son Gary is obviously a chip off the old block because after learning all the tricks of the trade in his father’s company, he went on out his own four years ago and set up McGeown Logistics Ltd.
Strong growth and retention of many long standing customers is testament to the fact that they recognise the importance of providing the very best in customer service time after time.